In the city that never sleeps, the new renovated Grand Hyatt New York is in the center of it all. Located on Manhattan's East Side, our prime midtown location is just steps away from the city's top attractions and major corporations. Times Square, Broadway theaters, Central Park and Fifth Avenue's world-class shopping - all within walking distance from our hotel. Our spacious and newly remodeled 1,306 guestrooms feature the Hyatt Grand Bed. The hotel has an amazing culinary team creating unique dishes for the New York Central and 24-hour room service. In this non-stop city, a 24-hour access business center and fitness center are available to our guests. You won't miss anything when you stay here, just steps away from all the glamor and excitement this great city has to offer. 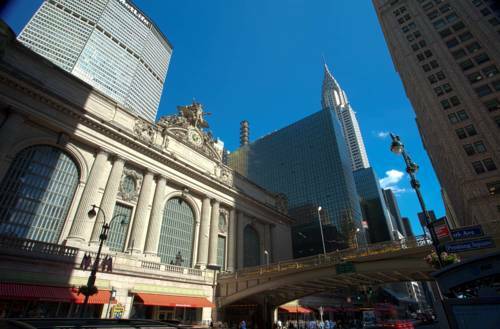 Adjacent to Grand Central Terminal on the East Side of midtown Manhattan 42nd Street; minutes from Fifth Avenue shopping, major corporate headquarters, the United Nations, Broadway theatres, major metropolitan museums, the Empire State Building, and many other attractions. Close to three major airports - LGA, JFK, EWR. 24 hour Grab n' Go Market.